Instantaneous oxygen consumption, muscle potential frequency, thoracic and ambient temperature were simultaneously measured during heating in individual workers and drones of honey bees. Relationships between these parameters and effects of thoracic temperature on power input and temperature elevation were studied. 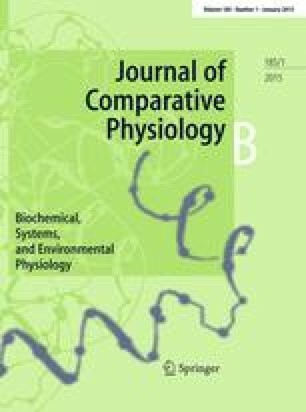 Oxygen consumption increased above basal levels only when flight muscles became active. Increasing muscle potential frequencies correlated with elevated oxygen consumption and raised thoracic temperature. The difference between thoracic and ambient temperature and oxygen consumption were linearly related. Oxygen consumption per muscle potential (μl O2 · g −1 thorax · MP−1) was two-fold higher in drones than in workers. However, oxygen consumption for heating the thorax (μl O2 · g −1 thorax · (Tth-Ta) · °C−1) was nearly the same in workers and drones. Thoracic temperature affected the amount of oxygen consumed per muscle potential (R10=1.5). Achieved temperature elevation per 100 MP was more temperature sensitive in drones (R10=6–10) than in workers (R10=3.6). Q10 values for oxygen consumption were 3 in workers and 4.5–6 in drones. Muscle potential frequency decreased with a Q10=1.8 in workers and 2.7 in drones. Heating behaviour of workers and drones was different. Drones generated heat less continuously than workers, and showed greater interindividual variability in predilection to heat. However, the maximal difference between ambient and thoracic temperature observed was 22 °C in drones and 14 °C in workers, indicating greater potential for drones.